No it’s not Pixar or Disney Studios, this time it’s Blue Sky that brings the movie Rio; by far one of the best animated flicks since Toy Story 3! Rio, the animated film by Brazilian director Carlos Saldanha, and starring Anne Hathaway, George Lopez, Leslie Mann, Jamie Fox, Will i Am and the surprisingly funny Jesse Eisenberg is a cornucopia of vibrant colors, sounds and sensory stimulation. 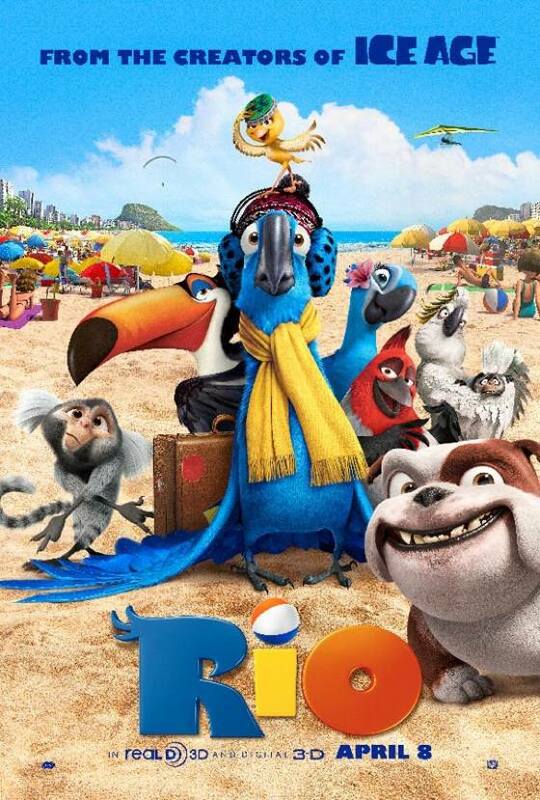 While the feature touches upon serious issues such as the illegal capture and smuggling of exotic fauna, it’s also a tender love story between two macaw blue birds (voiced by Hathaway and Eisenberg) and their parallel humans Linda and Brazilian naturalist Sylvio (Mann and Bernardo de Paula). What I liked about the film was that it cleverly serves a multicultural array of voices, which is as dynamic and colorful as the animation itself. The script is funny and entertaining, though very stereotypical at times, and racially offensive on occasion, something I’m sure Brazilians will not appreciate (monkeys pick pocketing tourists, Blacks being portrayed as poor and not very bright– Yikes!). Other than those two not so polite or correct, to say the least, stereotypes, Rio serves comedy for all ages, and an awesome soundtrack. The images of Rio are as breathtaking as the real thing. If you’ve never been, you’ll want to book a flight immediately and if you have been, it’ll remind you of why you should return over and over again. The film may be conventional to many but for me it was just the perfect story, which in the end gave me a fuzzy good feeling…and isn’t that why we go to the movies after all? Why you should watch it: It’s Rio de Janeiro for crying out loud! What else do you want? Eu gosto muito do Rio de Janeiro!